In 1503, Leonardo di Vinci submitted plans for a bridge across the Bosphorous. It ws never built. "“Amazing awe inspiring place”. Very very moving site. Attending for the 2015 dawn service we got to look around with a historian prior to the dawn service. The history for Australians here means this is a must visit." This is a full day private tour starting and ending in Istanbul. This Gallipoli Battlefields Tour explores all the major battlefields of the ANZAC sector of the World War 1 Gallipoli campaign. Depart early morning from your hotel in the old city of Istanbul for afternoon tour of Gallipoli. The World War I battlefields of Gallipoli are now a serene site. Visit the Lone Pine Australian Memorial and Chunuk Bair New Zealand Memorial, ANZAC Cove, Brighton Beach, Beach Cemetery, Ari Burnu Cemetery, Johnston's Jolly (where you'll visit original Allied and Turkish trenches and tunnels), 57th Regiment Turkish Memorial and The Nek. Return to Istanbul after the tour. 5. 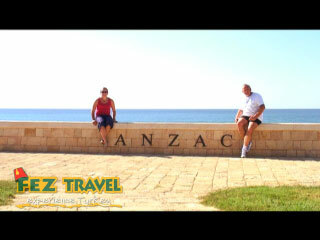 This tour does not depart during the 'Anzac Day' period between 20 - 26 April.